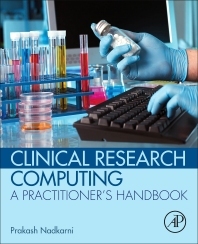 Clinical Research Computing: A Practitioner’s Handbook deals with the nuts-and-bolts of providing informatics and computing support for clinical research. The subjects that the practitioner must be aware of are not only technological and scientific, but also organizational and managerial. Therefore, the author offers case studies based on real life experiences in order to prepare the readers for the challenges they may face during their experiences either supporting clinical research or supporting electronic record systems. Clinical research computing is the application of computational methods to the broad field of clinical research. With the advent of modern digital computing, and the powerful data collection, storage, and analysis that is possible with it, it becomes more relevant to understand the technical details in order to fully seize its opportunities. Practitioners and clinical researchers involved in health IT systems; graduate students studying medical and health informatics; students in health IT programs. Dr. Nadkarni has been working in the field of biomedical informatics since 1989, with over 100 peer-reviewed publications in the field. He is the lead developer of TrialDB, an open-source clinical study data management system, which is used at multiple locations nationally and internationally. He is an Associate Editor of the Journal of the American Medical Informatics Association (JAMIA) since 2005, and was elected Fellow of the American College of Medical Informatics (ACMI) in 2002.